Everyone had a special teddy bear when they were growing up. Mine was Rupert and he went everywhere with me. When we went on holiday, I wouldn't let my parents pack him in the suitcase as I didn't want him to get squished so I'd carry him on board the plane with me. I'd tell him about my day and share all my secrets and of course, he talked to me too, if only in my imagination. My parents even joked that Rupert would be there on my wedding day (he wasn't, I'm not completely mental). Ethan already has a late collection of cuddly toys including Winnie the Pooh, the Muppets, a limited edition original brown bear from Me To You and a special, soft grey elephant that daddy bought him. 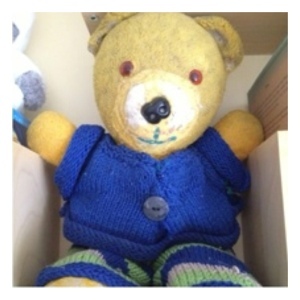 And sitting up there, on the shelves in his nursery, sits Rupert, next door to Ste's teddy bear George and out of arms reach (he's seen better days and it would break my heart if anything happened to him). 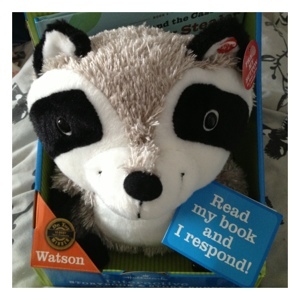 So when I was given a cuddly toy raccoon called Watson (just like my dog) which could come to life as a present for my birthday, I was excited for my little boy. This teddy bear would really talk back to him! I love children's books and this present couldn't have been more appropriate for me. 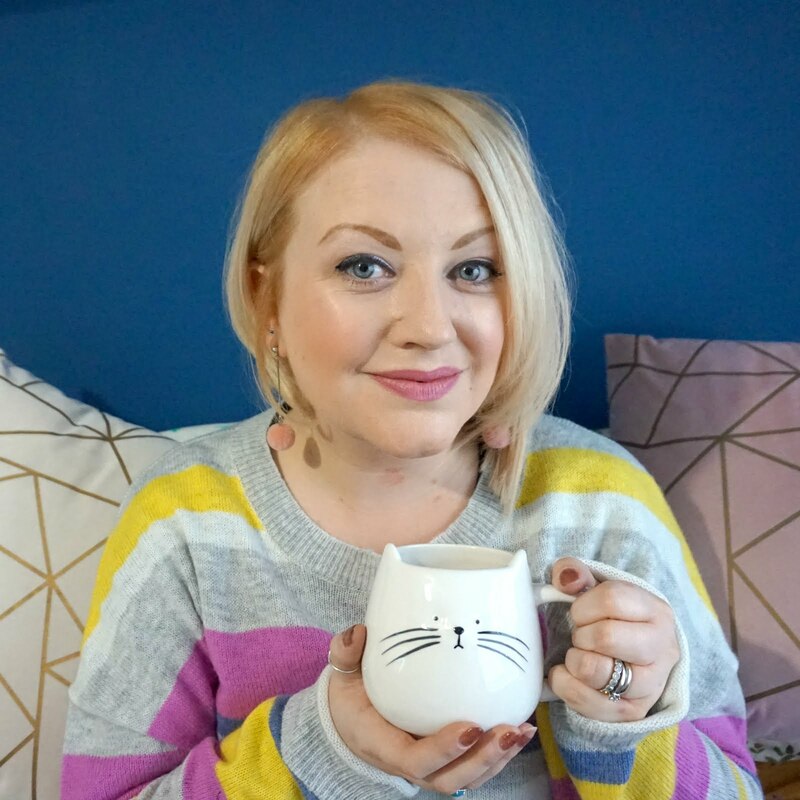 It's an interactive storybook and toy, and when you read the book out loud, certain phrases trigger Watson to respond with the next part of the tale. How magical is that? I'm not particularly good with funny voices, better get practicing, so it's such a great and clever idea to have a read-along buddy. The pictures in the book are very nice to look at too and the story is engaging, with two other books available for Watson. 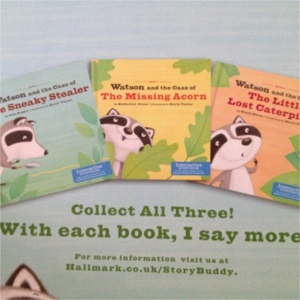 There's lots of different Story Buddy characters also available from Clintons so your child could have a whole talking cuddly toy clan - you'd just have to be careful to switch them off at night in case they accidentally start chattering away! 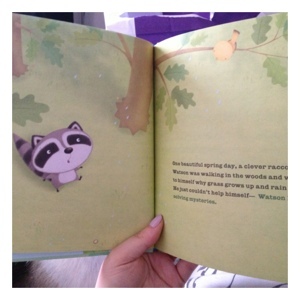 I loved the book and can't wait to share it with Ethan when he can see the pictures and follow the story. What's really funny is my dog Watson's face when you read 'Watson! Somebody call Watson!'. Do you still have your teddy or does your little one have a very special cuddly friend? Here's Rupert, who really has seen better days, but I know he still keeps all my secrets safe.